O God, who in your mercy led Saint Clare to a love of poverty, grant, through her intercession, that, following Christ in poverty of spirit, we may merit to contemplate you one day in the heavenly Kingdom. Through our Lord Jesus Christ, your Son, who lives and reigns with you in the unity of the Holy Spirit, one God, for ever and ever. St. Clare of Assisi was the first woman to practice the life of entire poverty as taught by St. Francis. Placed by him at the head of a few companions in the small convent of San Damiano, she governed her community for forty-two years thus founding at the gates of Assisi the Order of Poor Clares. Their Rule included austerities hitherto unknown in monasteries of women. They went barefoot, slept on the ground, kept perpetual abstinence and made poverty the basis of their lives. 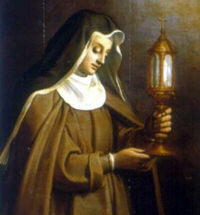 St. Clare died on August 11, 1253, and was canonized two years after her death. According to the 1962 Missal of St. John XXIII the Extraordinary Form of the Roman Rite, today is the feast of Sts. Tiburtius and Susanna. St. Tiburtius is a Roman martyr of unknown date who is buried on the Via Laviacana in the cemetery known nowadays as the catacomb of Sts. Peter and Marcellinus. St. Susanna, a Roman virgin, was also martyred at an unknown date. There are two churches in Rome which bear her name. 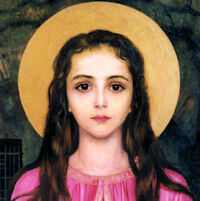 Historically today is the feast of St. Philomena, a young virgin and martyr of the fourth century.